Camping underneath a blanket of stars, thrilling whitewater, and exploring Grand Canyon is what we’re all about at Grand Canyon Whitewater. 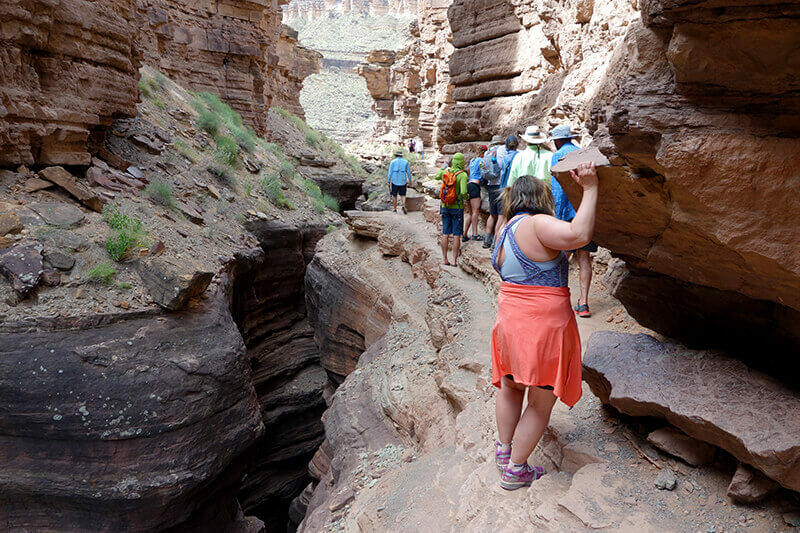 Our goal is to give you a full Grand Canyon experience. 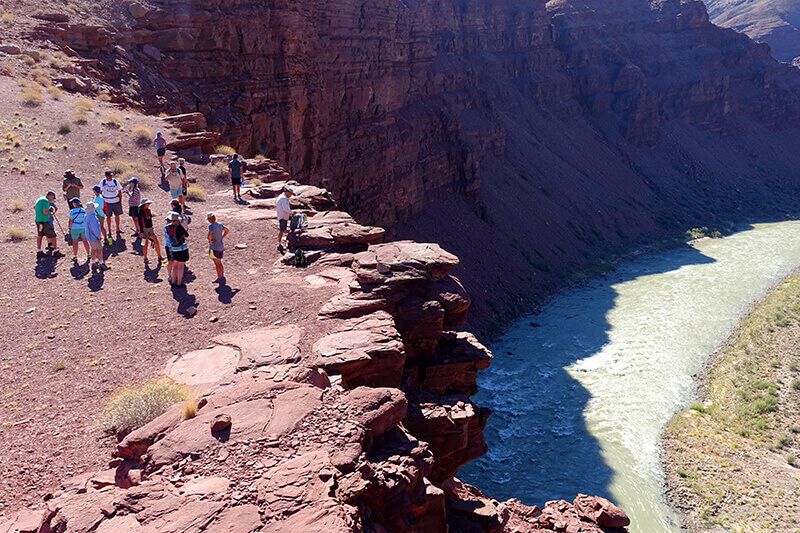 For many guests, exploring Grand Canyon by foot is the highlight of their trip. You can expect one to two side hikes per day, some of these may be a stop along the river and others may be right from camp. Like many aspects of your river trip, the details are unknown until you’re there. Our expert guides are factoring in the weather, river miles and other rafting groups into their daily plan. What we can tell you is all of these side hikes are optional and vary quite a bit in difficulty and length. 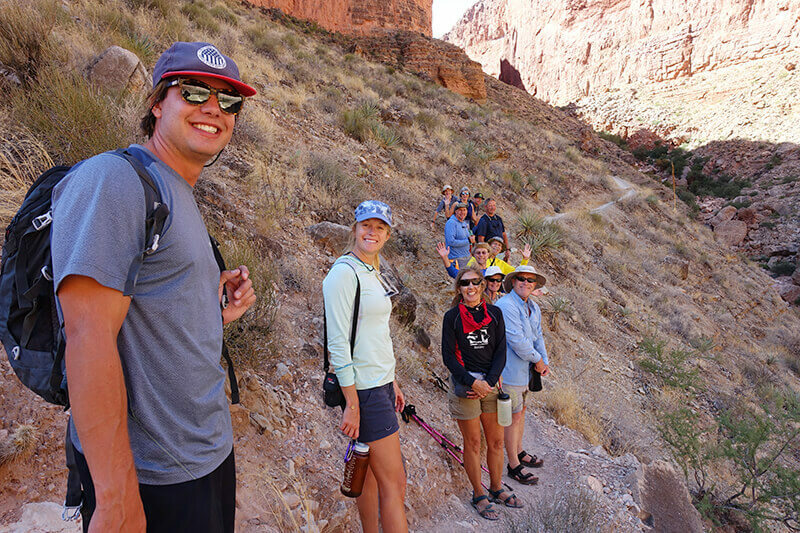 Unless you’re booked on our Hikers Special trips or a trip with a hike in or out of the canyon, most hikes on your Grand Canyon Whitewater trip won’t be more than about one to two miles round trip. Some may be shorter like Blacktail Slot Canyon, and others may be longer like The Patio above Deer Creek Falls. 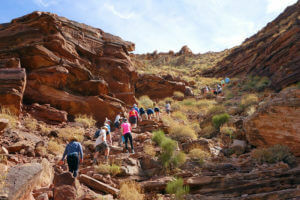 If you are on one of our Hikers Special trips, you can expect some longer and tougher day hikes. Your guides will give you an overview of the length, difficulty, appropriate footwear and amount of water to bring on these day hikes. All side hikes will have a guide leading the group. They often carry extra water, a first aid kit, and snacks. 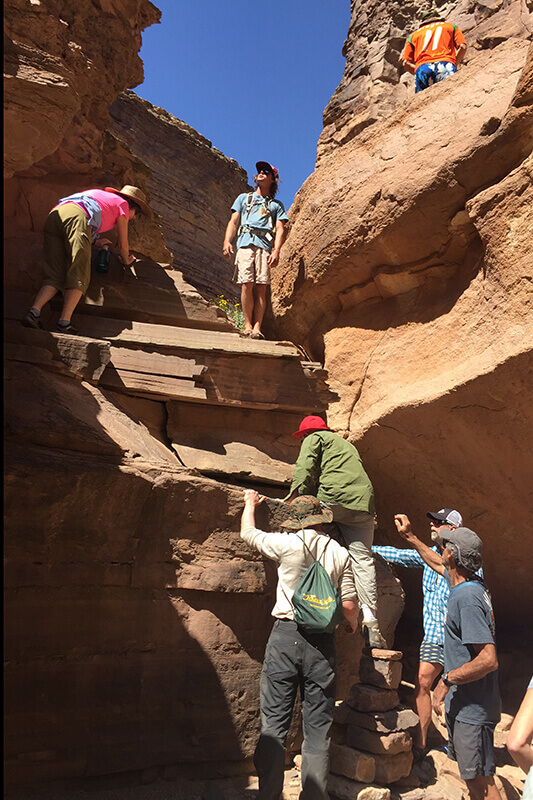 *NOTE* GCW guides give a description of each hike based on an average physical ability before you set out for your adventure, but they cannot determine exact difficulty for each person. Please make sure you assess your ability and communicate with the guides if you have any concerns or questions about a particular hike. Remember, you do have the option to remain at the rafts or beach rather than going on any day hike. 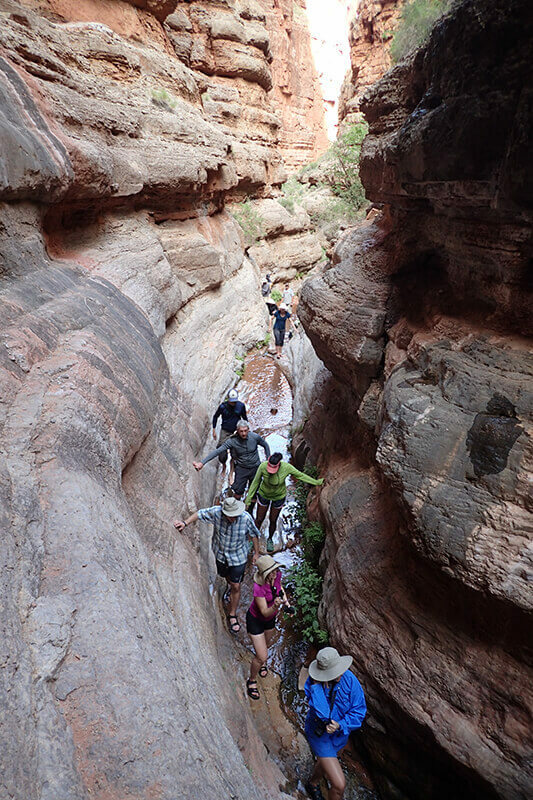 Generally speaking, because you’re in the bottom of the Grand Canyon, you can expect many day hikes to have less-than-perfect trail conditions, significant elevation gain/loss and potential cliff-like edges. Keep in mind that it is not uncommon to have loose rocks to navigate and cactus to avoid on the “trail”. 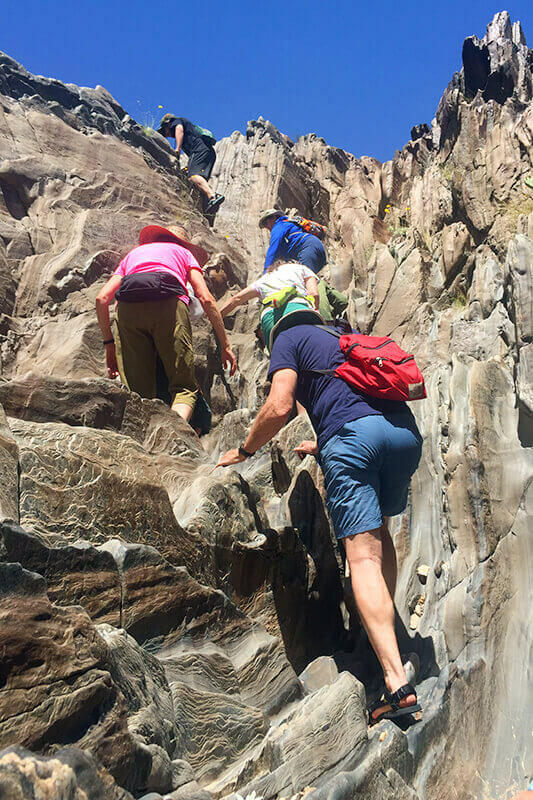 If your guide describes your upcoming side hike as “scrambly” you’ll most likely need your hands for climbing up or over large rocks. Climbing gear is not necessary but keeping your hands free to help you maneuver is beneficial. Hikes from the river can be tough, but well worth it. Please don’t be shy to offer or ask for a helping hand. Often times the lead guide will set a quick pace at the front of the group, however, feel free to take time to enjoy the experience. Check with your guide about the difficulty of the hike. Many of the side hikes are near or through water. Surfaces can be wet and slippery so it’s important to have shoes/sandals with good traction. For those hikes that are not around water, you will have access to your boots/athletic shoes in the community bag. If you use hiking poles and it’s easy for you to travel with them, bring them! Just hand them off to the guides when you arrive at the rafts and they will keep them in a safe and convenient spot for you. The Grand Canyon is a place of extremes. The best place to check for an accurate weather report is at Phantom Ranch. When you hike away from the water’s edge, you can expect the temperature to go up. 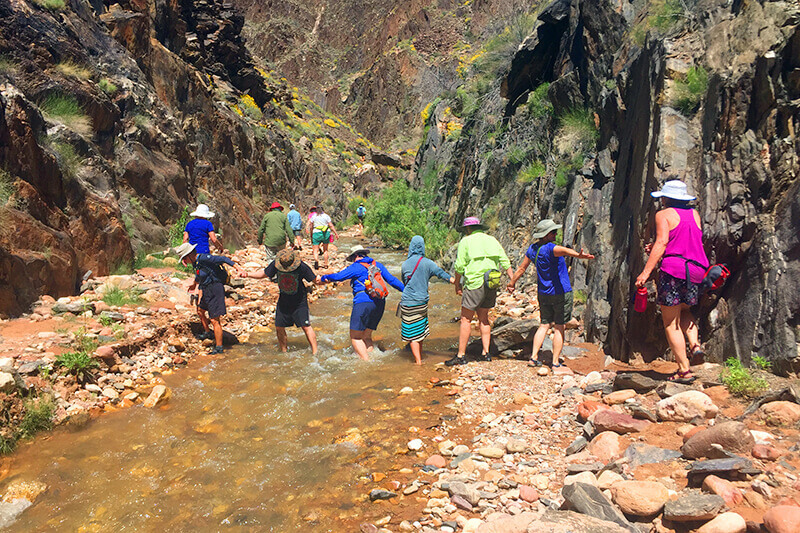 The best way to stay cool during these day hikes is to get wet! Take a quick dip in the river or side creek before you start. We recommend bringing a bandana, sarong or light-weight scarf on your river trip. You can dip these or your hat in the water and wear it around your head/neck to keep cool on and off the boats. A small Camelbak or drawstring backpack keeps your hands free while hiking. It may not be necessary on every day hike, but helpful for longer hikes to store your water, sunscreen, camera, etc. Almost all of the hikes are an out-and-back type of hike. So, if at any point you’re not feeling comfortable, let your guide know, and feel free to turn back. If you don’t feel up for that particular adventure at all, you also have the option to sit it out. We recommend bringing a book or journal to enjoy if you choose not to hike. Keep in mind: If you’re nervous about a hike, or if you have more questions, ask your guides! Communication is key! 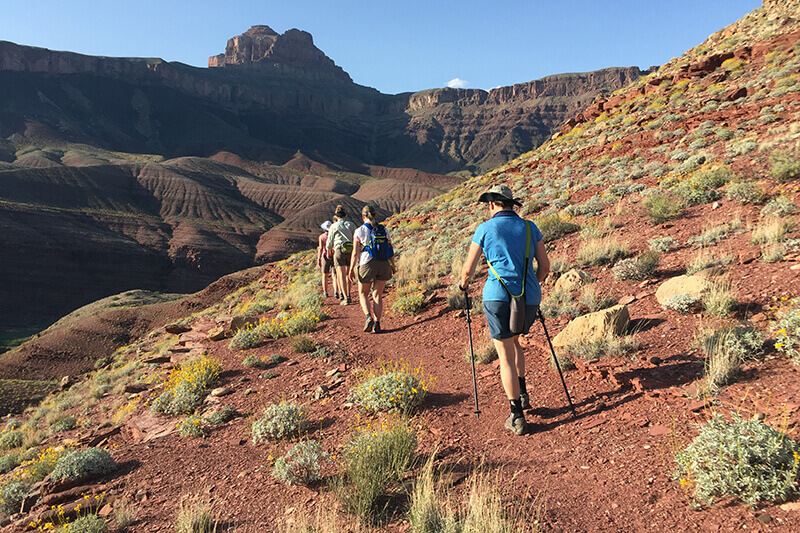 Hikers Special trips are only offered outside of the mid-summer heat in Grand Canyon to allow for more time exploring, hiking, camping and relaxing on your multi-day trip. 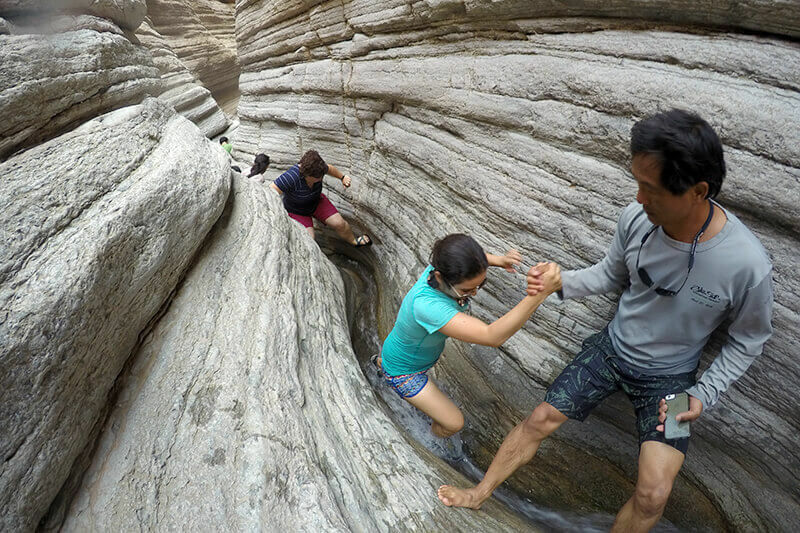 Expect the side hikes on these trips to be sometimes longer and tougher than any of our other trip types. Some may be up to 6 miles round trip and have significant elevation change, others may not. Always check the weather the week of your trip start date and follow our provided packing list. 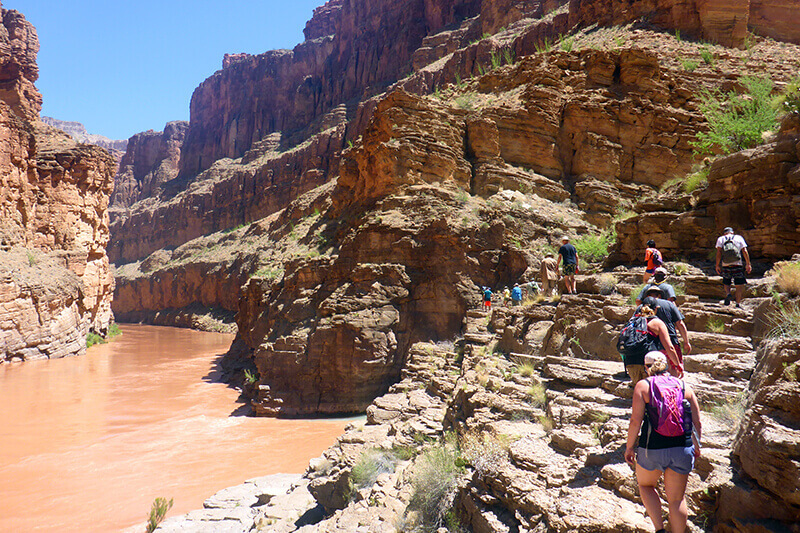 Let us know if you have any questions about your unique Grand Canyon Rafting trip!